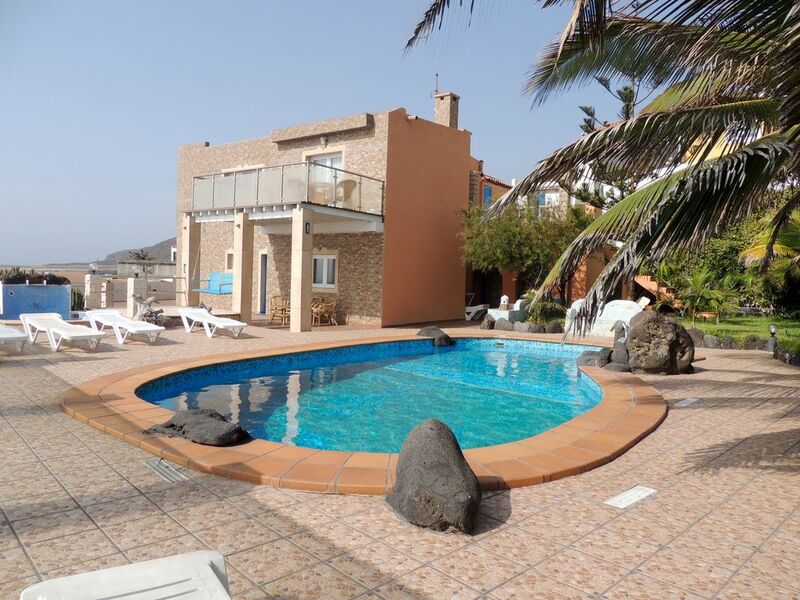 The house is in Cangrejera Beach, Villa de Mazo, in front of the sea it has a swimming pool and Jacuzzi with sea water (without chemicals, and that new water is changed with the arrival of the client), next to tropical garden with barbecue, with unbeatable views of the beach from the terraces and the balcony, 4 bedrooms 3 bathrooms, a living room and kitchen in the upper part and another in the lower part next to a pergola with hammocks. My accommodation is good for couples, families (with children), and large groups. Nos agrada el comentario que hace nuestro cliente sobre la Espectacular Ubicación de Casa Lola, Frente al mar del que recibes la saludable brisa marina con un alto aporte de Yodo beneficioso para la salud, en cuanto a lo que llama cosas viejas, mejor decir Antiguas, como las camas de hierro que se pueden ver en las fotos de la casa, si algun electrodoméstico no funciono debio llamarme que en pocos minutos estaría en la casa para resolver la avería o sustituir el aparado. If you like big resorts, this place is not for you. But if you are after a place where you listen to sound of sea waves , want to share a beach just with big crabs and have a great starting point to your La Palma trips don't look anywhere else. The villa is in a secluded area with just few houses and for most of the week we were there alone. Amazing Milky way you can see from the terrace. The Casa Lola is an older house, but spotlessly clean, we loved its style and forgiven some minor issues. Communication with owner was fantastic and felt really welcome. We also felt in love with La Palma. For us it's like a small copy of Hawaii's Big Island, but much closed. We will be definitelly back and stay in Casa Lola again. Gracias por vuestra visita a mi Casa Lola Vit, tienes nuestras puertas abiertas para cuando quieras volver. The villa is very well situated overlooking the beach, although would have been very hard to find - thanks for meeting us at the airport, Mario! Unfortunately the weather was not great, but we enjoyed watching the rough sea! It should be pointed out that the jacuzzi is heated only by the sun, and therefore hardly useable in January, and that the third bathroom is only accessed from outside. However we had a very good week and were well able to self-cater, with a Spar in Mazo, fruit and vegetable market also in Mazo at weekends, and full shopping facilities in Santa Cruz - and another market. Local restaurants were fine, particularly the mixed grilled fish platters - but check opening hours. This villa is even better than it looks in the photos, the best we have ever stayed in. The steps from the garden onto the beach were a real bonus, (our children are older which was fine, you would need to take care with younger ones) the beach is small with black sand but has fantastic snorkelling and fishing (we stuck to catch and release). Whilst snorkelling at this beach (which we had to ourselves most of the time) we saw trumpet fish (first for us), octopus, banded bream, rainbow wrasse, puffer fish, huge array of parrot fish, pipe fish etc etc. The villa itself was clean and comfortable and the glass all around the outside area provided fantastic views. There were some really nice little touches such as including washing up liquid, shower gel, hand soap, toilet rolls, sugar, kitchen roll, foil and lots of towels large and small, beautiful towelling robes and fluffy blankets for sitting out on a breezy evening. There was plenty of seating both inside and out and even a bonus second kitchen as well as an outside BBQ area. both kitchens were really well stocked with pots, pans, crockery etc etc. The pools were refilled with fresh seawater on our arrival and provided lots of fun! We also loved the novelty of fresh bread delivered every day. The only thing I can think of to improve the stay was to provide more information about the local area, i.e. nearest shops, doctors, chemist etc and instructions about what to do with rubbish/recycling. We had a hire car, so we were able to get about and explore a lot of the Island and its beauty. If you are thinking of booking this villa, don't hesitate, it's really beautiful. We can't comment about the owner Mario as he was also away on holiday during our stay but we were met by a very friendly lady (sorry I can't remember her name) who showed us all around and told us about the local area. Mario was a very good host. Even though we had a rental car and said we could meet him at the villa, Mario still insisted on meeting us at the airport. This was probably best as we may have had some trouble finding the villa otherwise. The villa itself was beautiful and very well equipped. You could tell that Mario and his wife had furnished it with a lot of love and care. There are 4 bedrooms, 2 kitchens, 3 bathrooms, and utility room. There was plenty of outdoors seating, the pool was very clean and well maintained and there was even direct access to the rocks/sea. We really enjoyed our stay here. Thanks Mario! Es ist einfach nicht schön, nach einem Urlaub eine Beurteilung quasi unbekannt abzugeben. Wenn uns etwas in einem Urlaub nicht gefällt oder nicht so ist wie versprochen, dann klären wir das immer vor Ort direkt mit den verantwortlichen Personen. Wir haben uns in der Casa Lola rundum wohlgefühlt und Herr Mario Perez Martin ist ein sehr guter Gastgeber.